Restoration Row: There’s a material reuse revolution going on. And it’s happening in Kensington. story by Samantha WittchenCan you hear that? There’s a movement afoot. Building materials are being given a second life, and hundreds, if not thousands, of tons of construction and demolition waste are being diverted from landfills. And it’s all happening in our backyard. In the past two years, a burgeoning salvage industry has taken root in Philadelphia, reclaiming building materials and selling them to homeowners, developers and artists who are breathing new life into our homes, businesses, schools and communities. The organizations focused on reclaiming these materials are converging in the Kensington and Port Richmond neighborhoods of Philadelphia, rapidly making it a destination for those looking to save some money on building materials, make an environmentally responsible choice and, in some cases, support the work of a charity. With construction and demolition materials comprising 30 to 40 percent of the waste in our landfills, it only makes sense that some people have gotten wise to the fact that we could be reusing these materials and generating revenue in the process. A large portion of that waste is beautiful old lumber—hemlock, Douglas fir and long-leaf pine—whose quality is much higher than anything you’d find at Home Depot today. While architectural salvage outfits that focus on high-value or unique materials are nothing new to Philadelphia, this new breed of building material reuse organization focuses instead on the everyday building materials that homeowners need—things like framing lumber, cabinetry, appliances and hardware. Facilities like Habitat for Humanity’s newly opened ReStore, the Building Materials Exchange and the Resource Exchange are changing the face of reuse. They’re taking it from something only a committed few were doing—namely artists and those seeking lower-cost materials—to making reclaimed materials and household items available to the general public on a larger scale. Each of these organizations focuses on a slightly different area of reuse, but together they are forming a robust reuse community in Philadelphia. Their convergence in the Kensington/Port Richmond area (the neighborhoods sandwiched between Fishtown and the Northeast) is not surprising, as most of these organizations operate on a very limited budget, and that’s where warehouse space is still affordable (although that’s starting to change as Kensington’s many industrial facilities are converted to residential lofts). Additionally, for ReStore and the Building Materials Exchange, it makes sense to locate in the community their work supports. As a result, Kensington is evolving into something of a salvage and reuse district. Perhaps the next time you need to pick up a couple of things at Lowe’s, you’ll consider a trip to Kensington and Port Richmond first. Hours: Thu. and Fri., 9 a.m. to 5 p.m.; Sat., 9 a.m. to 4 p.m. When habitat for humanity started kicking around the idea to open a ReStore in Philadelphia, they likely never imagined the store would gross $3,100 in sales on its first day open. 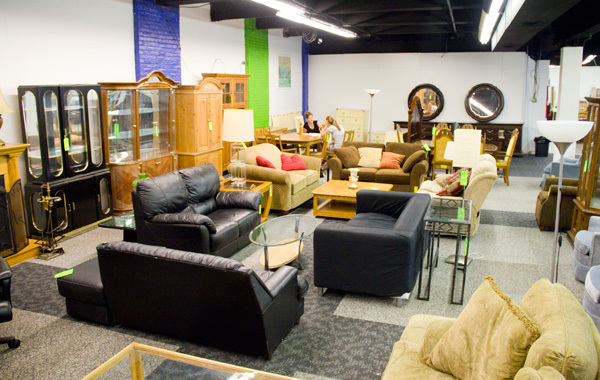 A retail outlet that supplies everything from overstocked kitchen cabinets to gently used dining room tables and reclaimed bathroom fixtures at low prices, ReStore is Habitat’s innovative way of generating revenue to support their mission of building affordable housing and stabilizing communities. The side benefit is that they’re also keeping hundreds of tons of waste out of the landfill each year. The facility, located in the old Lomax Carpet building in Kensington, is one of 700 ReStores in the U.S. and Canada; the top-grossing ones generate revenue of more than $2 million a year. The launch of the Philadelphia store may have been several years in the making, but it’s clear there’s no better time than the present for the launch. Corinne O’Connell, Habitat’s Director of Development and Communications, says that when she first started two years ago, she was receiving 30 to 40 phone calls a week from people who had material to donate; she had to refer them elsewhere because they had neither a space to store donations nor a truck to pick them up. 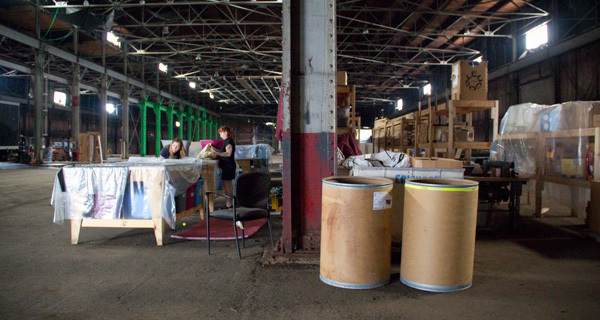 Operating out of Habitat’s 3,000-square-foot warehouse headquarters in North Philly, they held 18 garage sales before moving to the Kensington space, raising $80,000 and salvaging 70 tons of material. Lines would often wrap around the block waiting for doors to open on garage sale days. Thanks to the William Penn Foundation, which provided the capital support for ReStore to open, Habitat now has the space they need—19,000 square feet of it, in fact—and it’s packed with home improvement items and furnishings. One couple in Port Richmond outfitted their house entirely with ReStore items. And since ReStore had a truck donated to them in May, they’re booked two weeks out with pickups, all through word of mouth. In early August, a woman from the Main Line spied the ReStore truck making a pickup, followed it all the way to Kensington, and proceeded to go shopping. To get the word out about their August soft-opening, they reached out to the surrounding neighbors, and the community has been very receptive to their arrival. For Habitat, the location is a good fit for their mission: They operate ReStore in the very neighborhood in which they do much of their housing work. Additionally, they’re breathing a bit of new life into the community by occupying a vacant warehouse. They project to salvage 350 tons of material within a year. Which means ReStore pulls off a sustainability trifecta, helping the economy, society and the environment. While ReStore is already open for business, it will host a grand opening on Sept. 10. Hours: Mon. to Fri., 9 a.m. to 4 p.m. Started in 1985, the Building Materials Exchange (BME) is the granddaddy of building materials reuse here in Philadelphia. The BME is a membership organization run by Impact Services, an organization focused on helping its “Heart of Kensington” neighborhood through job training and creation to support community stabilization and development. BME serves low-income residents; members must meet federal low-income requirements. One of the BME’s first contributions was $1 million worth of lighting that had been over-ordered from Progress Lighting by JC Penney. In the early days, BME would barter the lighting fixtures with another organization in Baltimore to stock items the community needed, like general building supplies. Before Philadelphia had its robust network of community development corporations (CDCs), customers were referred by the CDCs’ predecessor organizations, and would then be able to shop at the BME for materials at about 20 percent of the retail cost. Since then, the BME has grown to 5,400 members, and it’s expanded from the original 5,000-square-foot space on Indiana Avenue to an 11,000-square-foot space at Front and Erie. Raul, the BME’s friendly manager, has been with the organization for 18 years, and in addition to his managerial duties, he also gives helpful home improvement advice to members who stop in and ask for it. 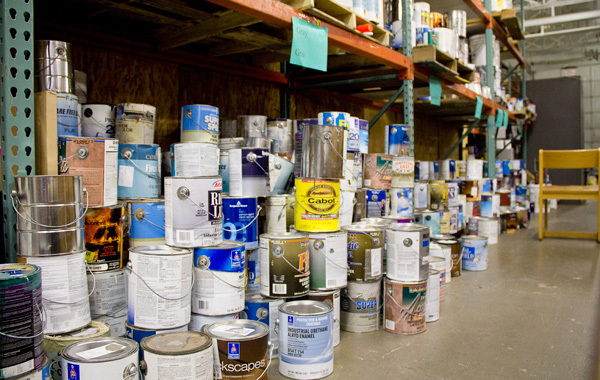 The place is packed with a variety of home improvement materials, including windows, doors, carpet tiles, hardware, and lots and lots of paint. Builders, retailers and individuals all contribute to the BME. It’s clear that the BME is an invaluable resource for the community it serves. In 1994, Evelyn Casillas had a fire in her home, which destroyed a portion of her second floor. Since her insurance was slow in processing the claim, she was having difficulty fixing the damage. A friend told her about the BME, and with their help, she was able to rebuild her house. In 2002, she started working at the BME as Raul’s assistant. John MacDonald, Impact’s president and CEO, says Casillas’ situation is common; many people come to the BME in times of emergency. MacDonald says their biggest challenge remains marketing—both to potential contributors and those who can take advantage of their services, especially since many of them don’t use computers. They market through word of mouth, and with difficult economic conditions, the flow of donations has slowed to a trickle. As a result, Impact will often go to auctions to stock the BME’s shelves with materials their members need, like lumber. But it’s fair to assume that this bastion of building materials reuse will weather this recession; they’ve made it through other economic fluctuation over the past 26 years. Even with other organizations like Habitat for Humanity moving into the neighborhood, they plan to continue to serve Philadelphia’s low-income population through this crucial resource for years to come. Visiting the resource exchange (re) is a bit like finding yourself in the scene shop of some local theater company, with set pieces, racks of framing lumber, and cast-off props filling the space. This isn’t surprising given the RE’s beginnings. Executive Director Karyn Gerred boasts a background in theater and film, having worked as a scenic artist for years. In 2009, she saw a need for helping the film and theater industries reuse set materials, instead of simply sending them to a landfill. Thus was born the RE, a creative reuse organization that’d been housed in a 5,000-square-foot Navy Yard building with no electricity, no plumbing and a leaky roof. Gerred speaks eloquently about the necessity of keeping high-quality movie and theater set materials, often only used for a short period, from being sent to the landfill. As she describes it, RE is working to “solve the problem of long-term environmental consequences of short-term productions.” Historically, it’s been difficult for the film and theater industries to find landfill alternatives because the reuse infrastructure in Philadelphia hasn’t been able to accommodate these materials. 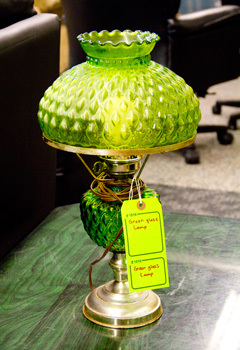 Architectural salvage places don’t want them, and thrift stores aren’t set up to receive the sheer quantity of materials. Enter RE. It focuses on structural and artistic reuse of these cast-off materials by artists, craftspeople, educators, students, homeowners and professionals in the green building and sustainable design fields. Framing lumber and sheeting reclaimed by RE enabled Greensaw to complete a $1.1 million renovation project for Yikes Inc.’s new oﬃces in Fishtown. Reclaimed materials from RE are being used for a project at Bodine High School in Northern Liberties to create public landscapes on underutilized lots. And many local theater sets have been built with material salvaged by RE from other area productions. With their original Navy Yard location inadequate for their needs, RE had been searching in earnest for a new location. They’d identified multiple city-owned buildings, yet the city has been unwilling to give them a break on the rent. But the organization’s luck changed, receiving a grant from PPL Energy and securing a building on Cedar Street, which gives them, as Gerred notes, “one of three in the startup nonprofit triumvirate (building, staff and truck).” RE will continue to operate by appointment until it is fully staffed.